The war with France had necessarily led to great demand for the building and use of shipping and other products from the expanding Port of Sunderland and consequently its wealth and stature had grown considerably. It had been felt for some time that an Exchange Building would be essential for the future prosperity of the expanding township and the idea soon materialised into firm planning with the slum area of the Half Moon estate being the preferred site. A prospectus was published showing that the building was to have brokers’ offices a news room, a post office etc. Shares at £50 each were quickly taken up for the building, which was to cost c. £8000. The first stone was laid on 10th August 1812 by Sir Henry VaneTempest with full Masonic honours and procession and was completed and opened to the public on 10th May 1814. 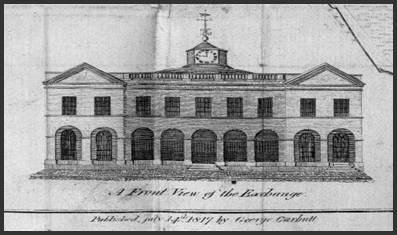 The grandfather of inventor Joseph Swan, a George Cameron, was the builder of the Exchange Building. Richard Fothergill a Sunderland man – inventor of a world first wire rope process which revolutionised the industry. This did not need the traditional long rope walk to spin the rope. Developed by Webster at his rope works in Deptford by the riverside at the end of Alexandra Bridge. 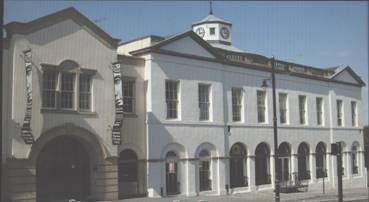 After a multi - million pound refurbishment and named the Quayside Exchange, the old exchange building now functions as a conference / banqueting centre and restaurant.